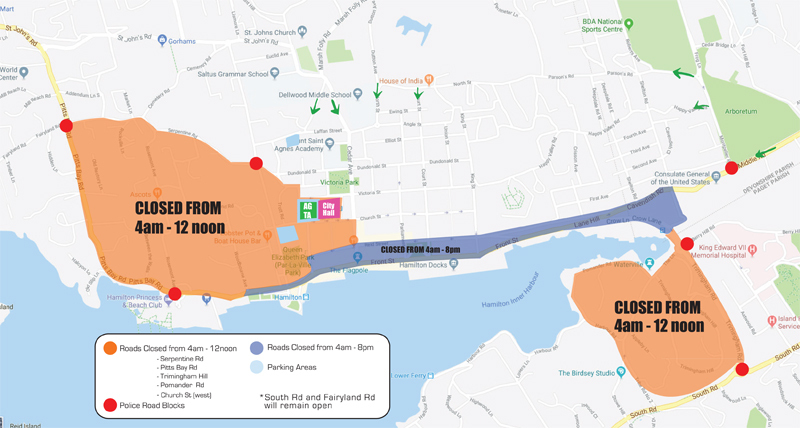 In an effort to provide full information, the organisers of the upcoming MS Amlin World Triathlon Bermuda Festival Weekend released maps and information on the planned road closures and parking restrictions. A spokesperson said, “We hope this will help to make it clear that the only day the roads are closed for the event, is Saturday April 28th, from 4am. “On Friday, all traffic will flow into and out of Hamilton as usual. 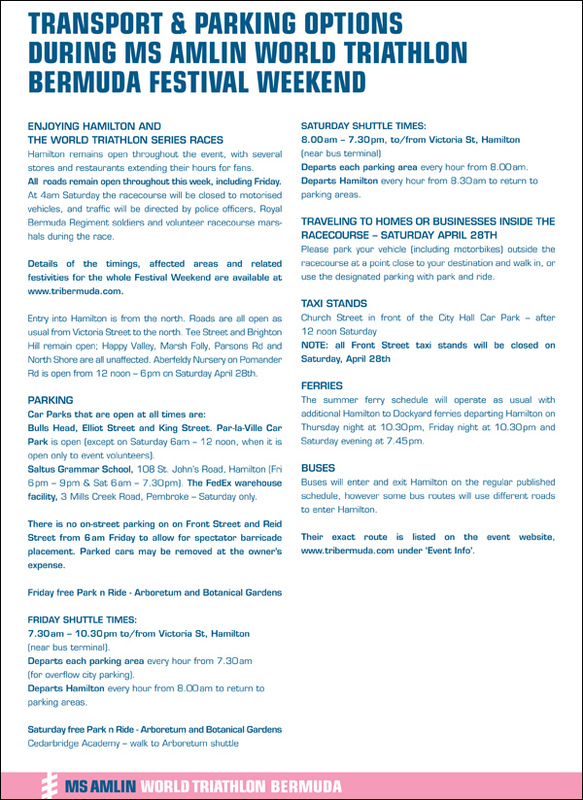 The only difference with Friday is parking, as on-street parking is limited on Front St, Reid Streets and other streets in central Hamilton that line the racecourse. “We attach a map [Spectator barricade placement] to show these areas where there is no on-street parking on Friday and Saturday, as spectator barricades will be placed on this route starting Friday morning. “This does not impact traffic flow and these roads will remain open on Friday. “The public is asked to park at Bulls Head, Elliot St Car Park, King St Car Park and Par-la-Ville Car Park [except Saturday morning] and other available street parking north of Reid St. Overflow parking is available on Friday with Park n Ride options. So for clarity, is South Road open or not? Can I find the actual route somewhere…..